Oldham, a company within the 3M Group, Personal Safety Division, is pleased to announce the launch of a new infrared sensor for detection of refrigerant gases and SF6. The new infrared sensor will provide a real advantage in terms of HFO fluid detection (hydro-fluoro-olefins) that are found in many applications, since it replaces the HFC (hydro-fluoro-carbons) that were formally used. Although other technologies are reliable to detect HFO, it still requires a lot of maintenance. As it is necessary to test the detector after each gas exposure to check that it is functioning properly (for catalytic sensors). Furthermore, experience shows that it is impossible to prevent leaks from these machines, as there is often fifty ppm of HFO inside the filling machine housings, and that is close to the detectors. In these conditions, the detectors should be tested every day, which is a lot of maintenance and headaches for the production line operators. Thanks to the infrared technology, this problem has been solved! The operating principle is based on the reduction of infrared radiation when gas is present. There is no chemical reaction or modification to the structure of the HFO molecule. 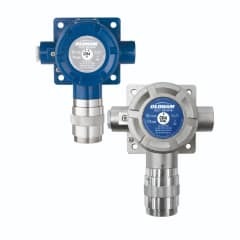 The sensor is not damaged by the continuous presence of gas or over-exposures of gas.